The nearly mature fruit of Evodia rutaecarpa (Juss.) Benth., E . rutaecarpa (Juss.) Benth. var. offcinalis (Dode) Huang or E. rutaecarpa (Juss.) Benth. var. bodinieri (Dode) Huang of family Rutaceae. Guizhou, Guangxi and Hunan provinces in China. Collected from August to November when the fruits are not split open. Processed with Gan Cao decoction. 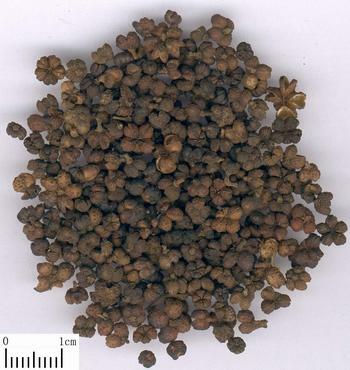 Pungent, bitter, hot; mildly toxic; liver, spleen, stomach and kidney meridians entered. Dispel cold and alleviate pain, check adverse rise of qi and arrest vomiting, dry dampness. It is the essential herb for the treatment of all pain syndromes due to liver-cold and qi stagnation for its actions of dispersing cold from liver meridian, soothing the stagnant liver qi and alleviating pain. For jueyin headache, white tongue coating and slow pulse, it is combined with the middle-energizer-warming and deficiency-tonifying herbs. For instance it is combined with Ren Shen and Sheng Jiang in Wu Zhu Yu Tang from Shang Han Lun. For hernia of cold type with abdominal pain, it is combined with meridian-warming and cold-dispersing, qi-moving and pain-alleviating herbs. For instance it is combined with Xiao Hui Xiang, Chuan Lian Zi and Mu Xiang in Dao Qi Tang from Yi Fang Jian Yi (Concise Explanation of Prescriptions). For deficiency cold of thoroughfare and conception vessels, stagnant blood obstruction, it is combined with meridian-warming and cold-dispersing, blood-nourishing and blood-activating herbs. For instance it is combined with Gui Zhi, Dang Gui and Chuan Xiong in Wen Jing Tang from Jin Kui Yao Lue. For downward flow of damp turbidity to the foot due to cold-damp type, it is combined with cold-dispersing and damp-eliminating herbs. For instance it is combined with Mu Gua, Su Ye and Bing Lang in Ji Ming San from Lei Bian Zhu Shi Ji Yan Yi Fang (Classification of Zhu's experiential prescriptions). It has the actions of dispersing cold from stomach and alleviating pain, checking the adverse rise of qi and arrest vomiting, and restraining acidity. For vomiting and abdominal pain due to stomach cold, it is usually combined with middle-energizer-warming and cold-dispersing, and vomiting-arresting herbs. For instance it is combined with Gan Jiang and Gan Cao in Wu Zhu Yu Tang from Sheng Ji Zong Lu. 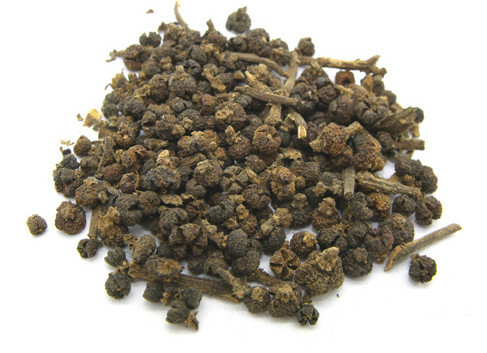 For hypochondriac pain, bitter taste in mouth, vomiting and acid regurgitation caused by transformation of depressed liver qi into fire and disharmony of liver-stomach, it is combined with the stomach-fire-clearing herbs, For instance it is combined with Huang Lian in Zuo Jin Wan from Dan Xi Xin Fa. It has the actions of warming spleen and dispersing cold, drying dampness and checking diarrhea. For diarrhea before dawn due to deficiency of spleen and kidney yang, it is usually combined with spleen-kidney-warming, intestines-astringing and diarrhea-checking hebs. For insrance, it is combined with Bu Gu Zhi, Rou Dou Kou and Wu Wei Zi in Si Shen Wan from Jiao Zhu Fu Ren Liang Fang. In addition, it has the actions of drying dampness and reliving itch for external use. For eczema, it can be decocted or ground into powder singly or combined with other damp-dispelling and itching-relieving herbs. Its powder prepared with vinegar is indicated for aphthae and hypertension by local application on sole. Decoct l.5~4.5 g. Proper dosage is for external application. It is not suitable to be taken in large dosage for a long time, and contraindicated for yin deficiency with internal heat.